rmweather is an R package to conduct meteorological/weather normalisation on air quality so trends and interventions can be investigated in a robust way. For those who are aware of my previous research, rmweather is the “Mk.II” package of normalweatherr. rmweather does less than normalweatherr, but it is much faster and easier to use. Most of rmweather’s functions begin with rmw_ so are easy to track and find help for. In this example, we have used dplyr and the pipe (%>% and pronounced as “then”) for clarity. The example takes about a couple of minutes on my (laptop) system and the model has an R2 value of 77 %. Grange, S. K., Carslaw, D. C., Lewis, A. C., Boleti, E., and Hueglin, C. (2018). Random forest meteorological normalisation models for Swiss PM10 trend analysis. Atmospheric Chemistry and Physics 18.9, pp. 6223–6239. Grange, S. K. and Carslaw, D. C. (2018). 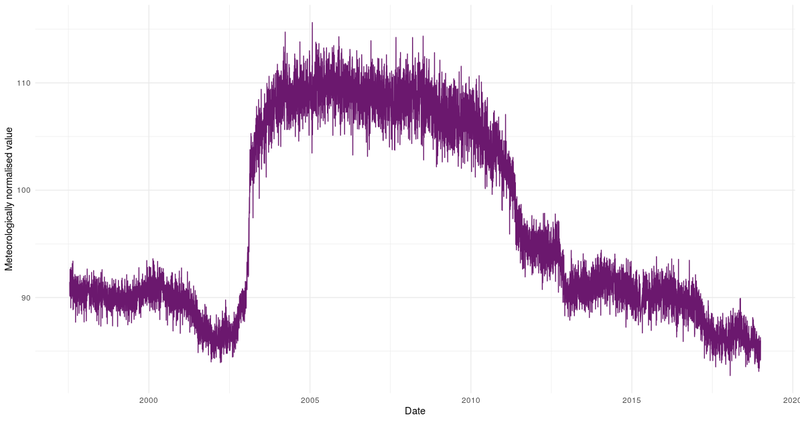 Using meteorological normalisation to detect interventions in air quality time series. Science of The Total Environment 653, pp. 578–588.